Entrepreneurs: Do You Have a Growth Mindset? I’ve been working for a startup, Student Loan Hero, for a couple of months now. Recently, I attended a retreat with others from the company. I was struck by the interest our CEO and other executive staff had in growth. They were interested in finding ways for us to grow as a company and as individuals. In fact, many of our activities were designed to push at least some of us out of our comfort zones. As it turns out, it’s a good idea to get out of your comfort zone every now and then and take risks. Not too long ago, billionaire entrepreneur Richard Branson wrote a blog post about the importance of having a growth mindset. The idea is to be open to change and improvement. We’re not often taught a growth mindset while growing up. In fact, many of us are encouraged to avoid risk when possible. I know that many times I’ve chosen a safer, surer path. However, entrepreneurs need to have a growth mindset. It’s important to understand when it makes sense to take risks. It’s also important to learn from failure. Too many of us see failure as the end. In reality, it can be a great teacher. Branson points out that we need to be willing to take a few risks and learn from failure. Reaching for that growth can make you a better business owner, and ensure that you keep moving forward. A growth mindset can keep you (and your business) from stagnating. For a long time, in my own business, I refused to provide additional services on top of writing. I just wanted to write and didn’t think I needed to provide anything else. However, as the internet has evolved and as the business of online content production has changed, I’ve been forced to change with it. It’s not a bad thing. Today, I provide a number of services. I (reluctantly) edit others’ work. I provide content direction. I consult. I even speak and teach workshops. These are all things I never thought I’d do. When you have a fixed mindset, you run the risk of stagnating. You can get left behind as others grow and change around you. The world is always moving. Technology takes that up a notch. If you don’t have a growth mindset, you’ll be stuck in the past — and your business will suffer. Your growth mindset applies to your personal growth as well. If you want to improve your life as well as your business, don’t neglect new directions. 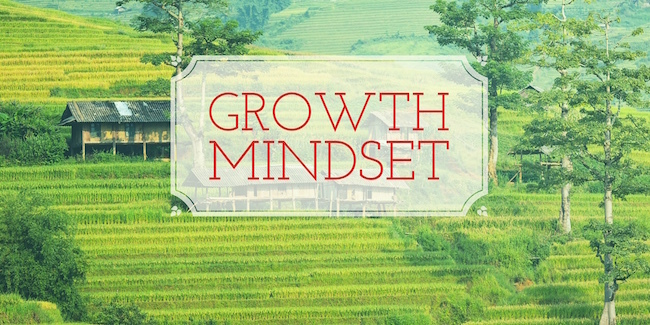 You might be surprised at how a growth mindset in your personal life can help your business. Being flexible and willing to learn new things and try new things can be a big help to your business. When you are in a state of personal improvement and feel that satisfaction, it translates to your business. I’m more productive when I exercise and eat right. It also helps me to try new things. When I’m practicing piano or learning guitar, I feel more fulfilled. Right now, I’m trying to brush up on my German ahead of a trip to Austria with my son next summer. A personal growth mindset gets you in the habit of trying new things, stretching your boundaries, and being open to improvement. All of these traits can help you in your business as well.